A home is burglarized every 18 seconds in the United States. In other words, that's 200 break-ins per hour or approximately 4,800 everyday. Every 1.6 minutes a burglary becomes violent and turns into a robbery.These statistics can be very scary to hear, but's important to know about burglary. The more you know, the better you can protect you, your family, and your property. Here are 10 surprising home burglary facts that everybody should know and our preventative tips. Burglars aren't afraid to enter your home through the main entry point. They may kick your door in, pick a lock, break glass, or (if they're lucky) they'll walk right into your home through an unlocked front door. Preventative Tip: Make sure your front door is locked at all times even if you're home. Use a solid wood or metal door rather than a hollow one. Solid doors are harder to break down. Use a heavy-duty knob-in-lock set with a heavy-duty deadbolt, and mount a security camera or image sensor above the door. A smart doorbell will allow you to see who is at your door, as burglars may ring the doorbell first to see if anybody is home. A smart doorbell will allow you to communicate with the person at the door and turn on lights in the house. You can even automate the system to turn the porch light on every time the doorbell is rang. This will make the burglar think you're home and scare them off. Never give anybody a copy of your house key or leave one outside your home. The best way to combat this problem is by eliminating keys altogether. Using a smart lock can rid you of physical keys forever. You can create unique user codes for family members and workers. This allows you to delete people after service eliminating the risk of your house key being copied and later used for burglary. You can also limit the times people have access to your home so they can only enter during their authorized time. A burglar typically lives within 2 miles of homes they chose to target.They get to know you, learn your common routines and schedules waiting on the perfect opportunity to strike. They may look for signs that you're on vacation, such as newspapers piling up, un-mowed lawn, or no lights on at night. Preventative tip: Vary your routine as much as possible. The best way to do this, is with home automation. You can turn lights off and on while you're not home to give the appearance that somebody is home. 3.Most criminals can burglarize a house in under 10 min. Criminals look for houses that are easy targets. Homes they know they can get in and out of quickly. Preventative tip:Don't allow your home to be an easy target! Protect your home with a home security system. An alarm system is the best way to scare of potential burglars. Don't leave any windows or doors unlocked and install a high-quality lock. Take it a step further by joining neighborhood watch groups and use a crime-mapping website to stay updated on local crime trends. Many people believe burglaries happen at night but actually most happen during daylight hours. That's because most people are at work or school which reduces the chance the burglar will be noticed. Preventative tip: Install indoor and outdoor motion-activated home security cameras so you can check on your home throughout the day. Plus, you'll receive an alert if the camera detects motion, so you can evaluate the situation immediately. People typically don't hide their valuables well on a daily basis and burglars know that. That's why the master bedroom is the first place they look. They rummage through closets, nightstands, and under mattresses searching for cash, jewelry and weapons. Preventative tip: Install a door sensor on your master bedroom door to alert you when that door is opened or closed. This is important in the event that a burglar enters your home through an unsecured window. Also, try to store your valuables in lock boxes or unlikely locations when you're not home. Almost a quarter of all burglars will enter a home through a first-floor window. Burglars target windows because they're less likely to be secure and are often hidden behind overgrown vegetation -concealing the burglar. Preventative tip: Securing every window in the house, or even just on the first-level, can get expensive. Hardware prices start adding up. The solution is to literally protect what's important. Rather than securing every window we can use one motion sensor in the living room and door sensors on high value items. For example, we may place a door sensor on the TV so when it's taken off the wall the alarm is set. Or on the master bedroom door so when that door is opened the alarm is set. Also, keep all windows closed and locked. The price of a home security system pales in comparison to the emotional and monetary cost of a burglary. The FBI found that the average monetary cost of a property being burglarized is $2251. The most expensive cost is the loss of a sense of security and peace of mind at home. Preventative tip: The best way to protect your home from burglary is with a home security system. No matter the budget, we can help you find a solution. Having a monitored security system may also qualify you for a discount on your homeowners insurance policy. The FBI reported that 13.6% of burglary crimes result in arrest. These crimes can be particularly difficult to solve. By the time law enforcement arrives the criminal has already fled the scene without leaving behind much evidence. And even if the burglar is caught, you may not be reunited with your lost property. Preventative Tip: The best way to protect yourself if your home is burglarized is with home security cameras. This provides the police with concrete evidence that your home was targeted and by who. Using a home security camera with a live video feed, a homeowner in Fairhaven, Massachusetts was able to see that two burglars were in his home. He immediately contacted the police, and the men were arrested at the scene. Having your home ransacked and your possessions stolen from you can be frightening. It's even worse for the victims that are home during the burglary. The U.S. Dept of Justice released a survey stating that victims are home 28% of the time during burglaries and that 7% of these victims experience violent crime. 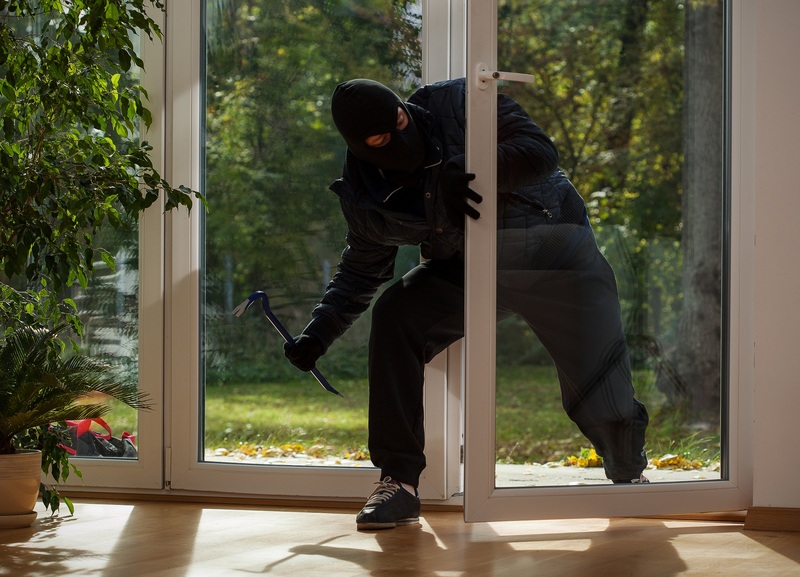 Preventative Tip: Make sure to arm your security system and lock all the doors even when you're home. This will help keep you and anyone else in your home safe. A report published by the University of North Carolina at Charlotte's Dept of Criminal Justice & Criminology found that about 60% of convicted burglars stated that the presence of a security system influenced their decision to target another home. Preventative Tip: Get a monitored home security system to help reduce the chance of being a burglary victim. Use the yard signs and window stickers you're provided to alert potential intruders to your security system.